As I surfed through your archives, I noticed a post about Kaffe Fassett Pebbles. I just had to email you. I was gifted with stash from a retired knitter. In it was a gorgeous panel of Kaffe Fassett Pebbles (the whole back) and lots of yarn. How did I earn this stash? Well, nothing except that I am probably the only enthusiastic knitter friend she has. She has incredibly bad wrists from her job as a real-time transcriptionist, so she has taken to gardening instead of knitting. This Pebbles piece is a work of art and simply years away from my skill level. Here’s a photo and another one. This panel is amazing and I am torn about what to do with it. Should I save it and wait for the day that I possess the skills to knit the arms and front panels and finish the dern thing to give back to Laura? Should I have it sewn with a lining and gift it back to Laura as an afghan? Any advice you can offer would be helpful. What a tantalizing tale, and what an artifact. This is my favorite Kaffe Fassett pattern. It calls for 13 shades of Rowan Donegal Lambswool Tweed, including some classic gloomy Rowan shade names–Storm, Pickle, Sedge. This yarn became extinct in the early 2000s, the victim of invasive non-native species of yarn which crowded out its habitat. It was too thin, too traditional, too . . . good to live. When I saw this pattern for the first time, years ago, I could not believe my eyes. I realize that it looks kind of like a leopard pattern gone mad, but the effect of all those tweeds together sunk deep into my psyche. Soaked right in there. O! The wonderfulness of it all. This pattern appeared in Rowan Number 24, fall 1998, in the geological period known as Classic Period Rowan. It appeared back before the Baroque Period began (Rowan Number 31 was the first time random embroidery appeared on a Rowan sweater), and long before the Mannerist Period started (Rowan Number 39 aka the current issue which is the craziest Rowan I ever saw). Seeing Julia’s artifact got me wondering if there are other unfinished Pebbles out there, so I went searching for other Pebbles in the field, and found this one, which Food and Yarn Angela has been working on here and there. I wouldn’t even hope to see a true, finished Pebbles. It would be too much to ask. I’ll see an ivory-billed woodpecker before I’ll see a Pebbles. As for Julia’s dilemma about what to do with this half-finished work of art, you know the only possible solution, right? A Blogpoll! PS Thank you, everybody, for the supportive comments about the book. Now that the book has finally come off the boat from Singapore (I was ready to go over there and hijack a cargo ship), I am just dying to see the projects what people are working on. Please, everyone, be sure to send us a photo and a few words so that we can include your work in the don’t-touch-the-paint-it’s-not-ready MDK Pantheon of Creative Genius. If we weren’t such HTML dorks, we might have the thing up all ready. We have already received some beautiful photos of Finished Objects. Wait ’til you see. Well, I voted for the afghan option (you could see that coming, I spose), but I do think there needs to be some border applied. One could use the amazing colors to stripe a mitered garter-stitch border. Just saying. Big pillow top! I have the back of a large steps sweater acting as a cover for a large basket of yarn that lives in my dining room. I keep thinking it would be a lovely pillow, once I forever abandon the idea that will someday grace my body. She could give it to you, you knit with the lovely wool, enjoying the process of working with extinct yarns (have you been following the woodpecker controversy??) and following a classic wonderbar pattern, and then you give the finished project back, coz you already have enough sweaters. It looks like the poll wants me to place my comment here…. I don’t know how long it would take her to acquire “the skill” needed to complete the sweater, but I vote for sweater completion. She may need to bribe someone to help and/or do it for her, but having inherited all the stash as well, it would be a very nice “thank you” as well as a wonderful ‘final’ memory for the knitter who has had to turn to gardening. If a shortcut is needed, perhaps a vest rather than an afghan? I vote for letting ann finish it so she can enjoy the wonder of knitting it and then send it back so she can experience the joy of knifting others! I’m with the “you knit it for her” crowd. You know you want to. And ten years down the line, when it’s done, she’ll gift it to you. Some people already have FOs from the book? HOW? It’s only Saturday BEFORE noon?! I need a babysitter. I think it ought to be a very special pillow/cushion – assuming it is a rectangle and not shaped? I say either follow Mary de B’s advice and knit it for her, Ann…or work with Julia to turn it into an afghan. You’d still knit on it — and maybe so would another someone or two who’d like to contribute — and then Julia could work the lining if she’s not sure she has the skills (although I’m sure she does) to work the pattern. I had thought that the sweater could be worked in pieces by a few volunteers, but I wasn’t sure about the logistics of that. As long as the same person knit both sleeves, and someone else knit both fronts, and someone else did all of the finishing, it would probably be okay. Anyway. Just my 2.5 cents. i say turn it into an pillow cover for her and keep the left over yarn. it’s a win, win situation for everyone! ps-i knit the baby bib last nite to go with my previously finished log cabin blanket. you guys did such a great job with the book, it’s so you! and so useful! The home computer won’t let me vote in the official poll, but I vote for a big cushy pillow. It will be a cross between a stuffed animal and a pillow, and what could be better than that? Your book is dangerous. Dangerous! In particular, I am working hard to remember that blankets are BIG projects. BIG and NOT portable and I already have THREE in process and another one in the stash…and yet I know, just know in my heart, that there are at least three more getting started this spring thanks to your book. (The Ode to the Blanket on page 72 is not helping.) Oh well. I had decided I wanted to take a break from sweaters this year, right? So really, it’s all part of the Knitting Plan. I’m on the Pillow Brigade because it would go so well with my sofa, but I’m still reeling with laughter at…Pickle! I say, develop those skills. I taught myself to knit continental last year just so I could do Fair Isle two-handed. And I’m not a young person. Skills can’t just arrive and be possessed. Plus which, the KARMA, dear, the KARMA! To finish something for somebody? Another star in your Martyr’s Crown! Yep, pillow. Maybe even two pillows? Such lovely colors shouldn’t be hidden away in a drawer or cedar chest. A pillow immediately jumps to mind. Lest someone should look like they have enetered into a rather outdated knitting safari. While beautiful and technically advanced, the final product as a sweater is downright scary. Yeah, I just can’t imagine that sweater, amazing as it is, looking good on anyone. It would make a GLORIOUS pillow. My copy of the book is in the mail … and I am waiting impatiently for it! I went to Borders and have a sneak peek of it … I can tell you that this is a book I am dying to read through after EZ’s Opinionated Knitter! I wish the postman brings good news today. How can there be completed projects? My copy hasn’t even arrived yet from Amazon.com! I think my copy of the book is still in Singapore! I can’t wait to get it. I with Kay make it an afghan with a nice mitered border! I bought the book last night on Amazon — can’t wait for it to get here! As for Pebbles: I say she has the thing framed as art and hangs it on her wall as a stunning monument to knitting. Though she could have it framed and give it back to Laura, but only if she’s feeling generous. On the book front: it’s absolutely stunning! I went so far as to rearrange the display at Barnes &Noble for more a prominent place. Congrats on an amazing book. OK, I too rearranged the books today at Barnes & Noble- shamelessly in front of my children I might add. They kept saying, Mom, aren’t you going to put those back? They just looked so good on top of the war books. What about making the front and sleeves with a single color for the time being? She could just select a favorite color and perhaps a simple textured pattern (moss stitch or a woven-looking texture) and finish the sweater that way. And she could always re-make it with the full multi-color pattern later, as desired. Just a thought. Buffy, I must insist that this guerrilla reshelving of books must stop immediately. Do you hear me? There will be no placing of books face out, no moving of books to prominent parts of a store, no covering up of awful books about unpleasant subjects that really ought to be covered up. Those bookstore people work really hard to put books where they think they ought to be, and we must respect that. No matter how much we would like to do otherwise. PS Thanks a ton!!!!!!!!! I owe ya!!!!!!!!! Julia should at least try to do a bit of Pebbles, it is such a glorious pattern! the skills will soon be aquired, much to her surprise. If she does not enjoy knitting it, there will always be the option of the pillow/afghan later! (which is really bad, since i have an exam on monday i should be studying for that instead). PS for Ann: I have seen a real, live Pebbles a couple of years ago at the Knitout in Boston. it took my breath away, I had to lay down for a while….. I have a finished pebbles and I waer it often with pride. I think someone else mentioned this possibility, but I think this panel would work really well as a large pillow cover. Make a pillow cover this size, sew the panel to it, and stuff it as a nice reading pillow for the bed or the couch. I think respecting the original knitter’s stopping point allows laura and teh original knitter to think of this not as another daunting UFO but as an end in itself. Maybe that’s just me with 7 UFOs of my own weighing me down. Aw, come on! Let it go!! Maybe there’s a reason it was never finished. Don’t let it be a burden. I voted for “other” and I think you should make a great pillow out of it. I know there’s some great book out now that recommends putting interfacing on the back to make a nice cushion. Just wish I could remember the name of that book…. Another idea is to turn it back into a real pebble and fling it in a nearby creek/pond/ocean. Let it go!! She should give (not gift – why doesn’t anyone want to say “give” anymore…but that’s another subject) it to you and you should keep it. Call it a lovely “congratulations you published a book!” present. saw your great book, just bought skeighty-eight colors of Knit Picks Shine to make a log cabin blanket. congratulations on your book, it’s beautiful. I am so glad that I can FINALLY have something else to knit other than scarves. I am working on the peaches/cream baby bib for someone I know for their first child.. This treasure of a book is soon to become a classic in the knitting world. Move over Martha Stewart here comes Ann and Kay!! When is the next book??? Mary de B had the same idea I did. Give it to you (or some other fabulously skilled knitter, I suppose – that would not be me!) and have it finished and then returned. How lovely for her friend to have it finished for her, in my opinion. “If you let something you truly love go…. It’s a sign – I’m certain you know what to do. ps – Okay – I confess to shamelessly rearranging at the local B&N too! Have a party and invite those who have the skills to finish the thing so they can show Julia the path to Kaffe-ness. Finish the sweater. Whether to gift back to Laura or keep for herself, the sweater deserves to be finished. I’m with Benedetta – Julia should at least try, and if she can’t do it then she can make it into a cool pillow. She could knit a striped back or something for it. I think Julia should give the dern thing to Ann, who will love it and pet it until the day she sees fit to finish it herself (maybe even for herself). Ann definitely possesses the skills to finish it, and her doing so would inspire the rest of us. Can you believe I actually have that Fassett book–but I’ve never made anything from it. I think Julia should send the whole package to Ann so she can feel that extinct yarn in her hand and experience the pleasure and pride of completing “Pebbles” – we can all encourage her and share the experience via the blog, and then she can return it to Julia to give to Laura. Or Ann could complete all but one sleeve and Julia can knit the sleeve, proving that she too is capable of meeting the Kaffe Pebbles challenge, we can ooo and ahhhh appropriately then Laura gets her sweater! Regarding the half-done sweater: I say pillow front, backed by velvet and trimmed with piping. Useful, beautiful, and more quickly done than finishing the entire sweater. Regarding your book: Wow. I bought my copy from Threaded Bliss yesterday and just sat here for an hour reading it. I purposely didn’t read it all, so that there are tidbits for me to savor this week as I pick it up again and again. This is my first purchased knitting book. I inherited a few great books from my mother’s stash when she died a few years ago and have also borrowed a lot from the library. But I’ve read your blog for about a year now, and saw all the great raves about it from other knitters I trust, and noticed that you’d be making an appearance at threaded bliss where I could join in the excitement and see the writers in person and…well…I jumped on the bandwagon. I wondered if I’d regret buying a 30 dollar book that wasn’t a reference book, and I haven’t. Partly, because it IS a reference book. I like non-patterns (recipes, if you will). I’m all about inspiration which is why I gobble up knitting and craft blogs- I feed off others’ ideas and get all giddy about what I can make. Anyway, giddy is how I felt when I read through your book. I got that jittery feeling in my stomach and this bounce in my step. The ideas are flowing already and I know I don’t have nearly enough time to knit out all these thoughts. Congratulations on a great book! Hope to see you in Nashville! Your book is ranked 35 out of all books sold at Amazon.com. Wow! Why, she should give it to you, Ann, to finish, of course! Make a cusion out of this! I-cord the edges with one of the darker color yarns. OK -OK – so exited I misspelled “cushion”! I think that while it would make an excellent goal to strive for with knitting skills, finishing something already so beautifully done might be too intimidating and take many years. Ripping it and starting over isn’t an option, all those short pieces of yarn and really, it’s too beautiful to rip. It would make a very small afghan, I’d think. What about turning it into a bag? Most anyone’s skills would be up to knitting a strap and around the flap. If it were to be lined it would be more durable, and I think it would make a great momento for your friend. Something good for toting around beach things, or catalogs when she visits the garden centers. Would the piece work as a bag? A clever friend of mine made a wonderful bag with an unfinished piece of my knitting. I love it! I voted “other” – and I agree with Ida (with elaboration). You don’t develop skill by waiting for it to show up. You develop it by trying. You have the *ability* now, practicing it is what will build the skill. Finish it, and keep it if you like it, or give it away if you don’t. I also liked the alternative of knitting solid color sleeves … that would be way cool. Just my tuppence. I vote she finish it now. There’s only two stitches, right? And when she’s done, she’ll be more than good enough. Everybody out here will help. i agree with ida and rayne. I voted that she should make an afghan or pillow cover out of it – but now i’m kind of with everyone who suggested she find assistance or let Ann help her. That would be fun for everyone. Also wanted to include a huge contratulations on your fantastic book. My copy arrived on Friday and made for excellent reading on a rainy weekend. Started my very first log cabin afghan on Saturday. Thank you! I also vote to begin knitting it yourself. Remember, knitting is just 2 stitches. Its overwhelming if you look at the whole pattern, but just look at one line at a time. Plus you have your friend to coach you. Good luck. I love the book! I have already made the scribble scarf–and you have solved a 30+ year old problem for me. My dad was a weaver–4 harness Leclerc loom. Before his arthritis incapacitated him in the 1980s, he wove some wonderful things, and also he tried his hand at spinning. The yarn was not terribly successful, but I bravely knitted it into a 300-lb. sweater. Of course, the garment was unwearable, but I shoved it into my stash and left it there for 30 years. Hey, my dad spun the yarn. He passed away last summer. I saw your pattern and the penny dropped. I could make beautiful wraps and scarves using Dad’s yarn as the accent. Each daughter and granddaughter will now be receiving something using Dad’s yarn as both a rememberance and a beautiful object. Thank you! Thank you! Thank you! Umm. Am I the only one who is willing to confess that the only way I would give up that wonderful hunk of knitting is to have them pry it from my cold, dead fingers? It would become a pillow cover — that I could look at, admire, think wonderful thoughts about the level of skill employed by my friend who knit it. Thanks for letting us know….now I ought to walk over to Borders Singapore for a peek and see if they have it! I think she should sell/rent/give the kit to one of you for completion, with the provision that you’ll either return it to her once you’ve finished it, or will give it a good home and model it for us on the website when you’re done. I didn’t see anything wrong with the pictures! I think Julia has the skills already. So go ahead and knit the front & sides! Unless, of course, it is just too difficult and way too much work to finish. In that case, just be honest and say you just can’t make yourself work on it anymore without going cRaZy. Then turn it into the afghan. so, if I shamelessly ripped off the mitre-square baby blanket idea from the blog before the book came out can I count that as a finished object–I’m working on my second one now–unlikely to have something else finished that is actually FROM the book for eons! Can’t wait to see it when I get home though. I think she should start finishing it now! Bah humbug at her skills not being up to it — we learn by doing! Make it a lifelong project — an “I’ll finish it before I die” thing. Knit a bit here, a bit there. Laugh on it, cry on it, live with it! 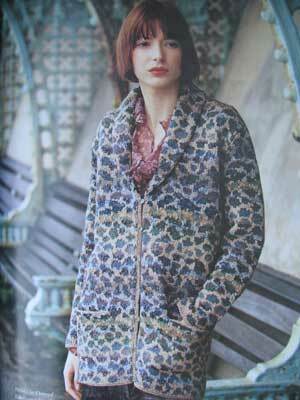 I speak as one personally defeated by something very much like Pebbles- Kaffe Fassett’s Leopard Skin cardigan. It was a Rowan kit, with essentially the same complexity re colour and pattern. A chart to follow for the leopard spots, and a guide for which three colours to use on each row (background, spot outline and spot infill), and a selection of yarns in delicious shades, and varying textures and weights including tweeds, silk mixes and good old fashioned DK wool. It lurks there, in the cupboard (actually, my mum’s cupboard. I banished it to the other side of the continent) as testament to youthful fearlessness and the belief that lust for yarn can conquer all obstacles. Also evidence that such things can, on occasion, lead you to take a larger step than you’re ready for. In brief: I think started it somewhere around 1990. It was definitely eariler than 1998. I had knitted a little bit of simple two colour fair-isle before. I fell in love with the picture in the Rowan kit catalogue. I knitted two sleves, with completely different and varying guage, and an uncountable number of ends. I realised the weight of work to complete it (including unravelling and starting again), and the likelihood of failure, and I gave up. If I ever retrieve it from the monthball laden corner in which it hides, it will probably be unravelled, or made into a small patchwork cushion (the sleeves, although large, aren’t big enough for a decent sized cushion). In fact, in Rowan Mag 18 it features as a cushion. In short- I vote for a cushion. She could make a coordinating striped afgan to go with it from the spare yarn. I suggest that only the most skilled and focussed of knitters should attempt to complete it.